Who will the JLA choose to take on Firestorm? First, be sure to pick up Justice League #20 if you haven’t already. It came out a few weeks ago and features some good Firestorm moments. Well worth the time and money for any Match-heads. Second, I wanted to take a moment to discuss the closing caption box. Check it out below. If you haven’t been reading Justice League of America (JLA), then you need to know this team was assembled with the secret purpose of taking down the Justice League (JL) if ever necessary. Each member of the JLA has been recruited specifically for their ability to take down a specific member of the JL. 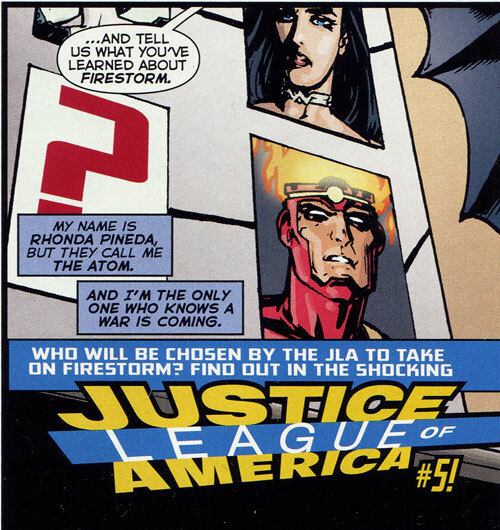 So the caption box above poses the question, “Who will be chosen by the JLA to take on Firestorm?” Good question. Anyone willing to hazard a guess? I have a sneaking suspicion it’s … wait for it … Professor Martin Stein. I know, you’re thinking, “Wha- What?!? !” My reason for this is why else was Professor Stein brought back in Fury of Firestorm #20. Prior to that, Professor Stein was dead as far as DC editorial was concerned, and any creators inquiring about bringing him back were shot down (or so the rumor goes). So why bring Professor Stein back in the final issue of Firestorm? I can’t think of any reason other than Geoff Johns wants to use the character in one of his Justice League books. Anyone else got a theory on the JLA recruit or why Professor Stein was brought back? Posted in: Firestorm #10: New 52 v2 (Ronnie/Jason), Geoff Johns, Justice League of America, Professor Martin Stein. ← Daily Planet Headline: Make Way for Firestorm! The promotional art/three-way cover for “Trinity War” shows DOCTOR LIGHT in the mix, and the character was recently introduced as working for ARGUS in JLA. Light versus Firestorm isn’t a perfect match-up, but c’mon, this is a board that pitted Katana against Wonder Woman! If not Doctor Light, then maybe the Atom herself if she’s really a double agent, or else someone else from the League’s recruiting drive in issue #18. The 3 way cover also has Star Spangled Girl attempting to blast Firestorm. I just assumed they deemed her the best fit on the team to take him down. Possibly because she is a teen girl and she could “woo” Firestorm before knocking him out. Well, call me crazy but I think the obvious choice is Captain Atom. But considering his fate in Firestorm #15, I guess that is unlikely. I think Stein was brought back in a last ditch nod to long-time Firestorm sufferers in much the same way that a significant list of the rogues gallery was brought back in the end. I doubt there are immediate plans for most of those characters, but it sure was fun seeing them again. It was a shame that Jurgens did not handle the Firestorm relaunch under “52” from the beginning. It would have been nice to see Jurgens introduce the Rogues on a slower pace. I think they brought Martin back just to keep their options open. I sort of doubt that there are serious plans for bringing him back into the alter ego fold (otherwise they would de-age him, not give him a bald head and long geezer hair). But, in case there is some kind of clamor or groundswell for the original pairing, he’s there…. What Lance Martin said, too.